San Xavier del Bac rises abruptly from the Arizona desert. The church was built in the 18th century and its façade includes relief carving as well as sculpted figures. This is the largest, and most elaborately decorated church in this part of New Spain that still stands. Although two bell towers were planned, the right one was never completed. The central part of the façade has both relief carvings and plaster statues, which would have been painted with bright colors. The dome of the church is visible just behind the façade. The building at the left is a mortuary chapel, where bodies were laid out before burial. The first friar known to arrive in this region was the Jesuit Eusebio Kino, who founded missions in northern New Spain, in Sonora, California and Arizona. Today, San Xavier del Bac is part of the Tohono O’odham Indian Reservation. Although foundations for a church had been laid in 1700 under the guidance of the Jesuit Eusebio Kino, the church that now stands was overseen by the master builder, Ignacio Gaona. He worked with local Tohono O’odham people to construct San Xavier. Substantial funding for came from wealthy families to the south, in Sonora, Mexico, suggesting how elites of the region had a stake, both financial and religious, in the evangelization of the larger region of northern New Spain. The church is built of stone, wood, adobe brick and lime-plaster, with rubble-filled walls. It also had glazed windows. As was true of many churches across Spanish America, the church was built by indigenous labor. In this case the Tohono O’odham people of the region built the church under the supervision of a master builder, Igancio Gaona, and Franciscan friars. The construction took 14 years, from 1783-1797. The church suffered earthquake damage in the 19th century and has been partially restored. When the Jesuits were expelled from the Americas in 1767, Franciscans took over their activities at San Xavier del Bac and supervised the construction of this large and elaborate church. The church had close ties with others across northern New Spain, especially those built in Sonora, Mexico. Not long after completing his work on San Xavier, master builder Ignacio Gaona moved to Sonora, where he also built the church of La Purísima Concepción de Nuestra Señora de Caborca. One of many churches built by indigenous people in Spanish America, distant from but connected to families and religious organizations across New Spain, San Xavier del Bac witnessed, and resulted from the shifting fortunes of different religious orders. This church is still in active use serving the local Tohono O’odham community. While the picture suggests the church is isolated, it is actually very close to Tucson, Arizona, one of the fastest growing cities in the southwestern United States. Tucson’s strong connections across the U.S.-Mexico border are different than those that saw the construction of San Xavier, but the history of such connections is confirmed by the construction in the 18th century and the on-going life of this church. 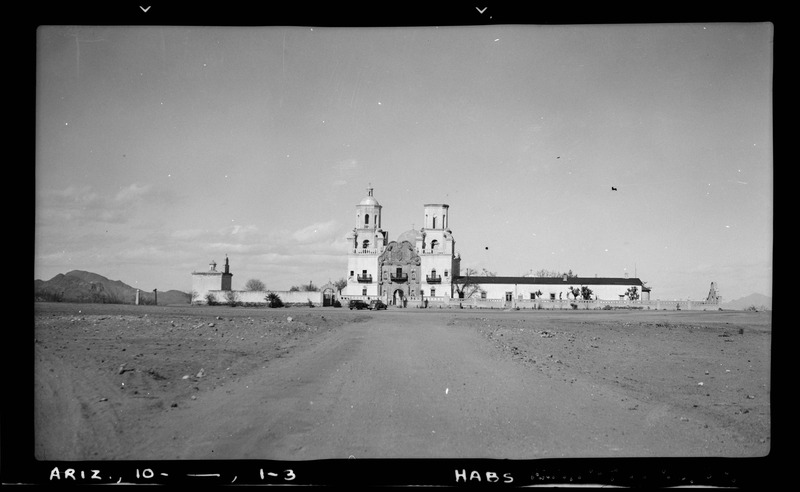 Frederick D. Nichols, San Xavier del Bac, Distant view looking north, January 1938. No. 3 and 171. 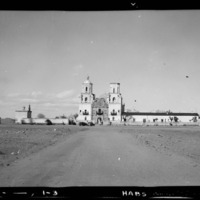 Library of Congress, Prints and Photographs Division, Historic American Buildings Survey, HABS ARIZ,10-TUCSO.V,3-3. Schuetz-Miller, Mardith and Bernard L. Fontana. 1996. “Mission Churches of Northern Sonora” in The Pimería Alta. Tucson: The Southwestern Mission Research Center.